Wandering elegantly across the savannahs of Africa, rhinoceroses are the emblem of the wilderness. They move with an elegance and grace that contrasts their prehistoric frames and unquestionable power. Horns pointing skyward, faces cloaked in emotion, these are special animals that truly take the breath away. Black rhinos and white rhinos? What’s the difference? Both black and white rhinos are grey in appearance. It’s the black subspecies that is most critically endangered and there are less than 2,000 of them left in the wild. This is the rhino you’ll mostly see in East Africa, although a few are dotted about the parks of Southern Africa. Black rhinos have a distinguishing hooked lip and are browsers, feeding off bushes and shrubbery. 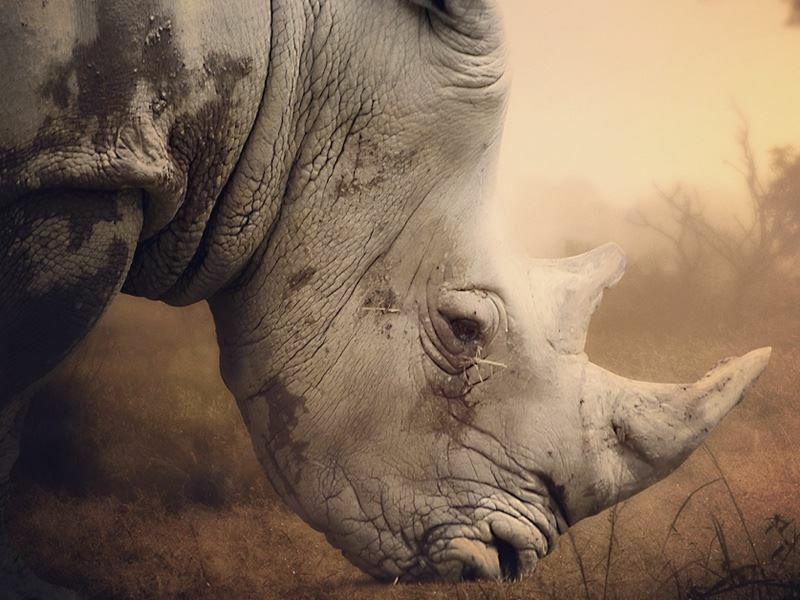 Over half of the world’s rhino live on the savannah of the Greater Kruger, spread out across the national park and a variety of unfenced private reserves. These are southern white rhinos, the Southern African grazer that you’ll also see in a handful of reserves across the rest of the region. Although there’s close to 20,000 of them in the wild, it’s these rhinos that are really feeling the brunt of poachers. Put the two rhinoceros species side by side and you’ll notice that the white rhino is much larger. To enhance conservation, a number of reserves have impressively relocated species, so white and black rhinos now inhabit the same landscape. Kenya’s Laikipea conservancies area offers some thrilling encounters with both. We can also connect you with excellent guides in the Kruger and Namibia’s Etosha, who can show you both rhino species on wild open landscapes. For a real safari treat, Ol Pejeta Conservancy is also home of the only three northern white rhinos left on the planet. Visit soon because breeding has been unsuccessful so far, so the subspecies will soon have disappeared. Both black and white have an impressive bulk and sense of power. Yet these are shy and reserved creatures, with behaviour that confounds their undoubted power. They plod softly across the savannah, causing goosebumps to rise and the camera to click furiously. We love the moment of calm that dominates the ambience when a rhino wanders past. Spot some animals and it’s hard to contain your excited shout. Spot a rhinoceros and you just smile, enchanted by the intimacy of the experience. Adult white rhinos weigh over two tonnes and their size draws gasps. Like most grazers, you’ll see them on the open grasslands and savannahs. Guides will keep a respectful distance as rhinos really don’t like to be disturbed. Look past the armoured shell and fierce horn, because these are amongst the most tranquil and relaxed of African mammals. Smaller black rhinos feed in denser savannah, which makes them harder to stop. They’re incredibly shy and you really need to be exploring in the cool morning air to have a chance of spotting them. Once the sun is beating down, black rhinos like to retreat to their private solace. A great example of this is found in Ngorongoro Crater, where you’ll rarely see the resident black rhinos after 9am. Rhino conservation is huge at the moment and we prefer to celebrate the successes rather than dwell on the poaching. Africa does incredibly well in preserving a natural world that disappeared from Europe many centuries ago. Furthermore, the biggest impact on rhino numbers came when they were shot in their hundreds of thousands by colonial farm owners (rhinos used to love their crops). Conserving the rhinoceros is being enhanced by a greater understanding of the animal. It’s possible to visit these giants on foot, with skilled trackers that ensure the rhinos are resting peacefully before you can get close. Mosi-au-Tunya National Park offers the experience, which is a complete change of pace from visiting Victoria Falls in the same park. We can also recommend a number of conservation projects where you can meet some of the researchers and gain first-hand knowledge of the techniques being used. Critically-endangered animals are never going to be easy to spot. Other than the Greater Kruger and certain Laikipea conservancies, seeing rhinos will be a rarity rather than an everyday. Botswana hardly has any and they’re long gone from Uganda and Rwanda. However, the great news is that rhinos inhabit more and more parks and reserves across the continent. So on a multi-stop East or Southern African safari, time might stand still as this exquisite wonder wanders past.